Sophomore wide receiver Keyon Dilosa taken to jail early Wednesday morning and booked on third degree domestic assault. He posted $1,000 bond. 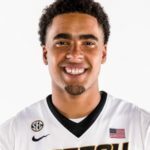 According to Missourinet affiliate KTGR, a witness told police Dilosa got into an argument with his girlfriend just after midnight outside Harpo’s in downtown Columbia, and punched her in the face. Former Missouri coach Gary Pinkel was on the radio in St. Louis and said that he is in remission. Pinkel stepped down last November after announcing he was battling non-Hodgkins lymphoma. “Physically I’m fine,” Pinkel said. The honeymoon is over for Saint Louis Billikens basketball and their new coach Travis Ford who made quite a splash with his hiring. They dropped to 2-4 after last night’s 68-64 loss to Samford. I’ve got a great soundbite from him…basically saying no more Mr. Nice Guy. Mizzou fans want Kim Anderson gone…the same fan base that wanted Pinkel fired after two years. The fans are coming after me after I said we should treat this year as year one of the K.A. era. How many year 1’s does he get? He doesn’t get a pass on losing out on all these in-state recruits. This is all on him. Just gonna punt the two worst years in program history? He skates on that for free? This comes from the same fan base that wanted Pinkel fired after his first two seasons when he couldn’t even get Missouri high school football coaches to visit with him. So he went and brought it a kid from Ohio to be his QB. By the way, those two young freshman for Anderson…Jackson and Hughes, where are they from? Oh yeah…OHIO! I lay this out as simple as I can as to why Anderson needs 2-3 more years.